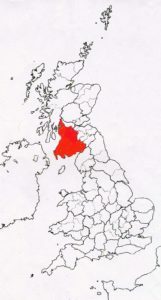 The historic counties of Wigtown, Kirkcudbright and Dumfries, lie in the south of this area. Dunbarton, Lanark, Renfrew and Ayrshire are in the north. Fairly standard work, following the Northern tradition is used here. But often it is accompanied, with some outside fixings. Which can be useful, when the wind blows. 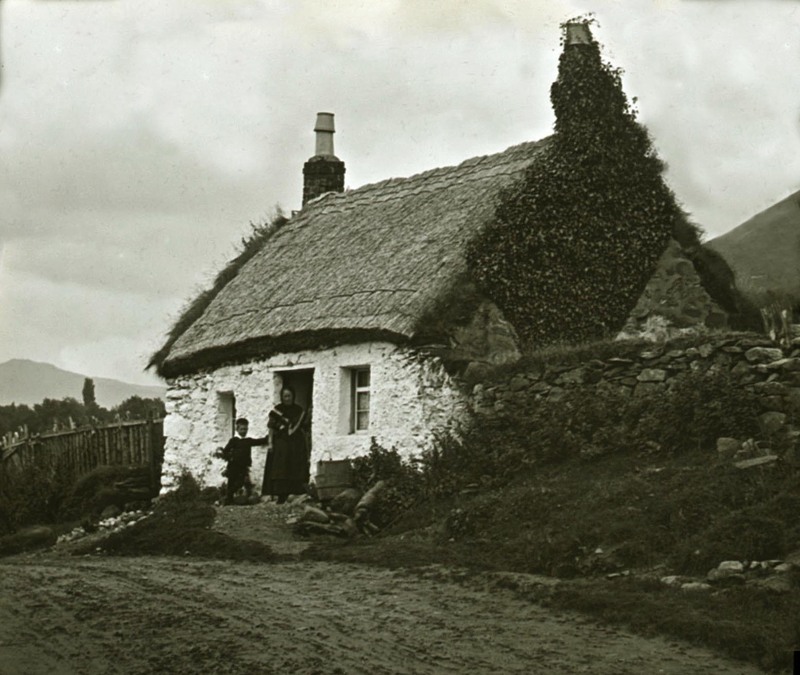 In even more exposed coastal spots, with fewer resources, Highland thatching methods once held sway. Tranquil times… At Knowehead, in the old county of Kirkcudbrightshire. 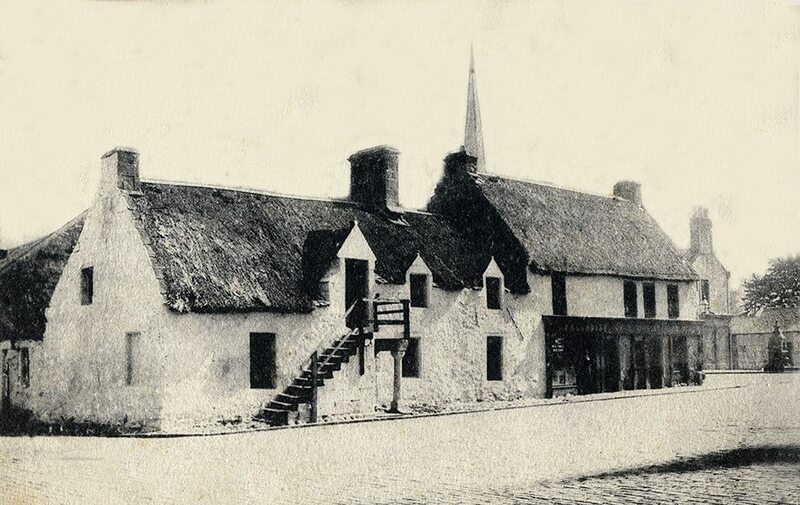 However, a couple of decades or so before this group assembled; one Tom Hunter, whose home was in right hand cottage; had spent the night on this thatch roof… Holding things together, during the Great Storm, of late December 1879. The night of the Tay Bridge disaster. Tom didn’t take any more chances with his thatch; as it now shows a heavy caber frame, as extra fixing. In the past, the usual wide range of materials were used, in these south west counties but straw remained the most common thatch. 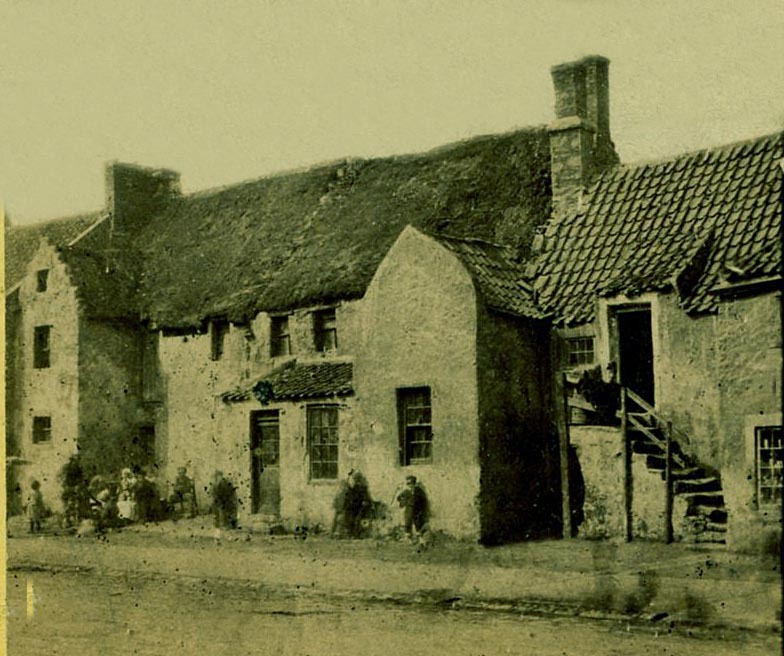 It covered most dwellings in Renfrewshire, according to the Agricultural Report of John Wilson, in 1812 and was being stitched on with twine, in Dunbarton in the 1790’s. Back in Renfrew, Mr Wilson noted the local thatcher’s wages. ‘Thatching per sq yard, with straw supplied.‘ paid three pence in 1795 and was fifty per cent more 1809. But suitable straw had doubled in price in the previous thirteen years, to two pound ten shillings per ton. 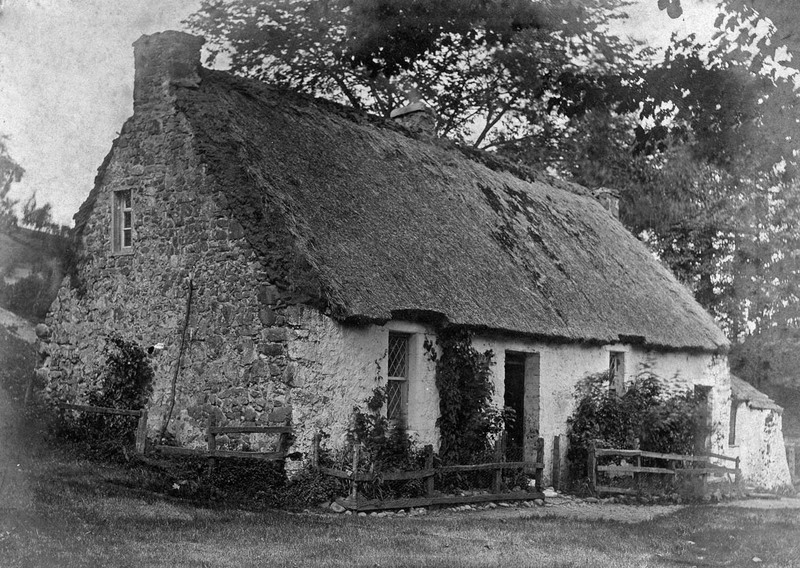 Rarity… Apart from this ‘Cruck Cottage’ at Torthorwald, near Dumfries; most of the thatches, left in the area, are on buildings associated with Robert Burns. The poet’s often rather close association with the craft, follows on in the next page. 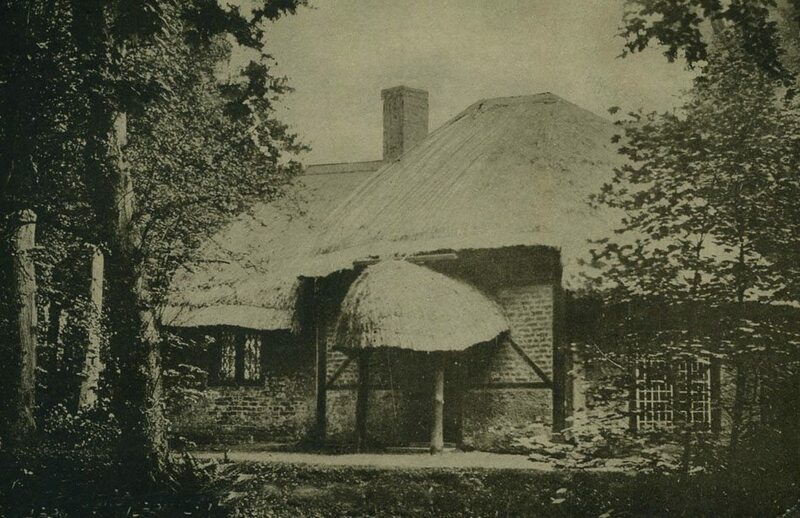 (Robert Burns and Ayrshire’s Thatch ) This old cottage, was renovated with a long straw roof on a turf base; with some horizontal roping, for extra fixing. All resting on a Cruck framed roof. 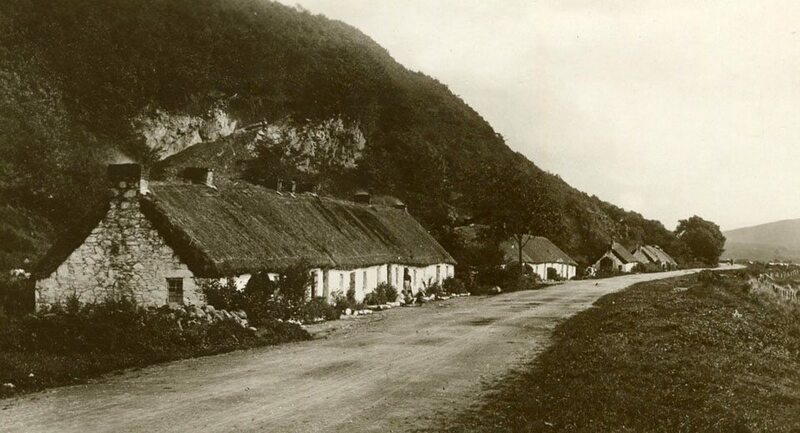 Below an Edwardian image of Mouswald, a village lying a few miles south of Torthorwald. 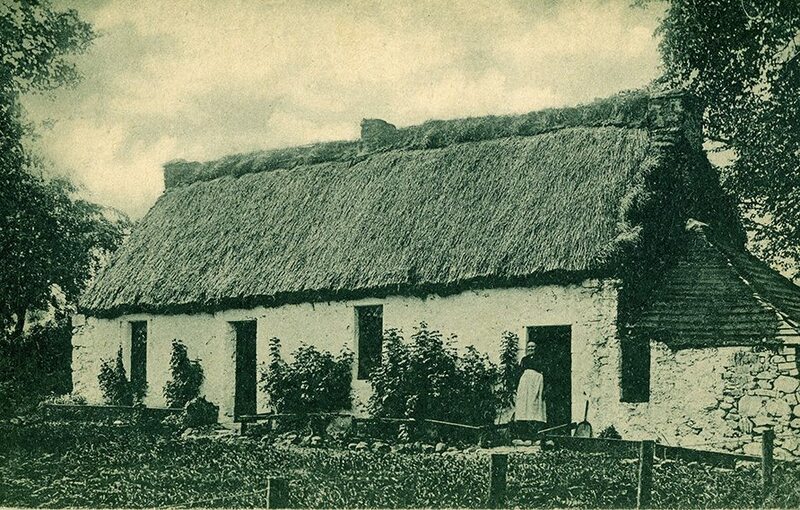 The thatch shown here has the same curves, as the newer roof but no roping; with turf, as well as straw ridges. 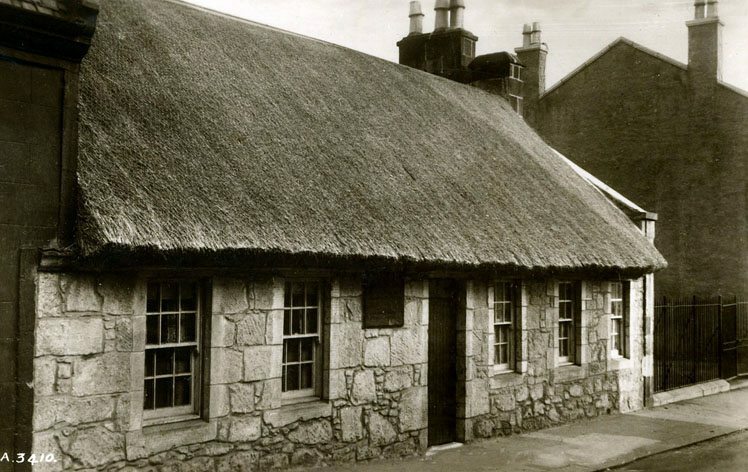 Poetic Renfrewshire thatch… In Queen Street, Paisley lies the home of Robert Tannahill ( 1774 –1810). Known as the ‘Weaver Poet’. Who spoke of ‘weaving threads and verses alternately’. He wrote in the local dialect, like his near contemporary Robert Burns. He helped found the Paisley Burns Club and became its secretary. 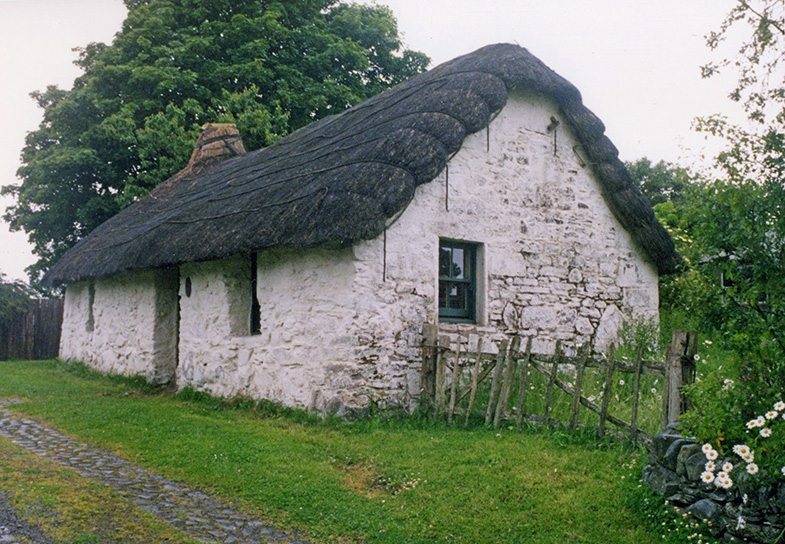 The cottage he lived in from a child, retained it’s thatch until 2003, when a fire forced a change of roofing. More Renfrewshire thatching… No extra outside fixings required here, being away from the windy coast and hills. 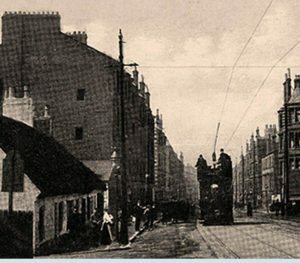 These Edwardian photos, show a mixture of straw and heather coating, on the left, in the old county town of Renfrew. 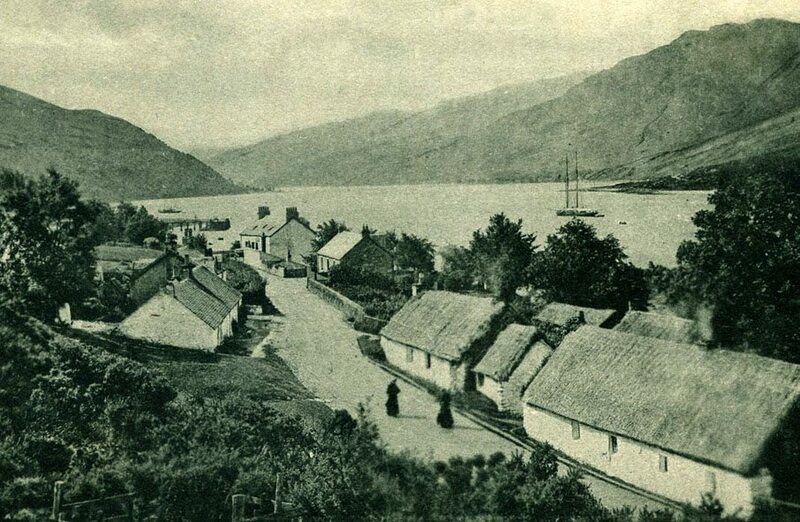 And neat straw thatching, on the right, at Barrhead. Both having a ridge of timber. 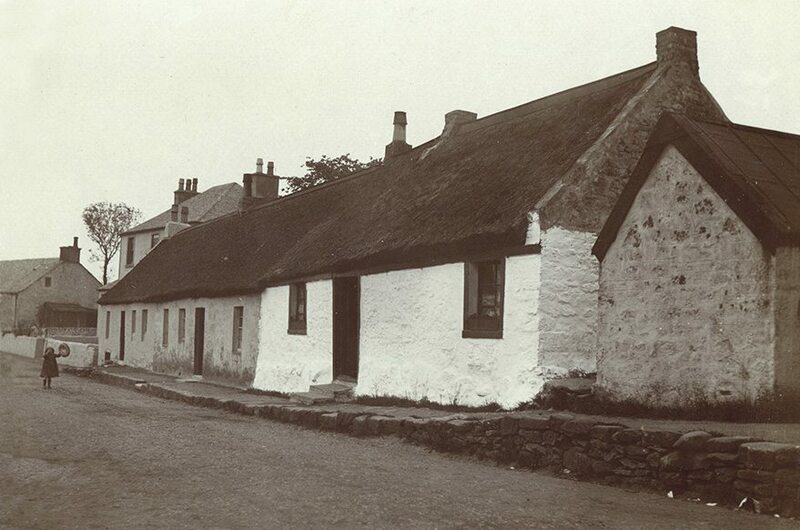 Turf edged Lanarkshire thatch… The upper and lower images, are of the same cottage, at Biggar. The upper seems older, showing a stobbed straw thatch, ridged in turf. The lower picture dipicts a much neater roof, again edged and ridged with turf. A first glance, a roof of Tay water reeds would seem lkely but on closer inspection, the roof is of straw. Perhaps using some very carefully thrashed material, in the manner of combed wheat reed? 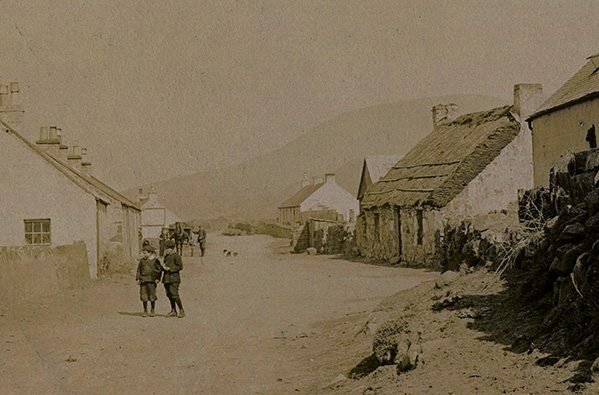 ‘On the road to Ballantrae’… Near the Ayrshire coast, around 1905. The right hand cottage has a thick gable, of neatly layered turf. Which also forms the ridge. Some crook and caber fixings, assist the standard thatching, to stay in place. In Ballantrae… ‘The Foreland’, on the beach, if the fisherman drying his nets is anything to go by. 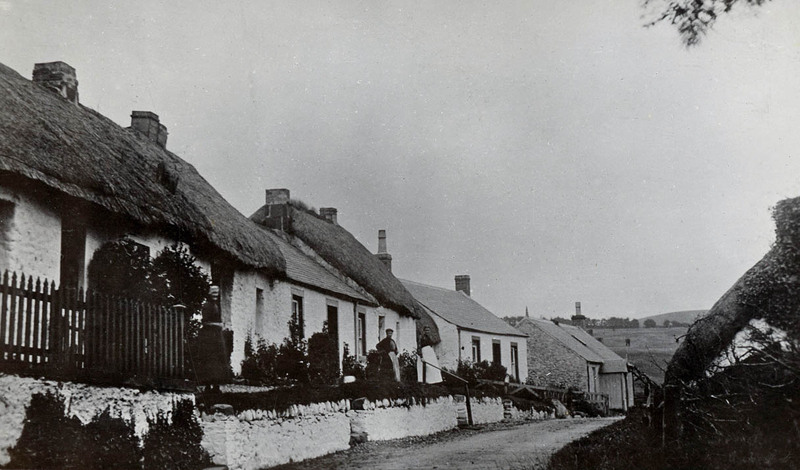 This long row of thatch, contemporary with the upper image, shows turf ridged straw roofs; one patched with turf. The odd leaning caber, to help guard against wind damage, is also in evidence. 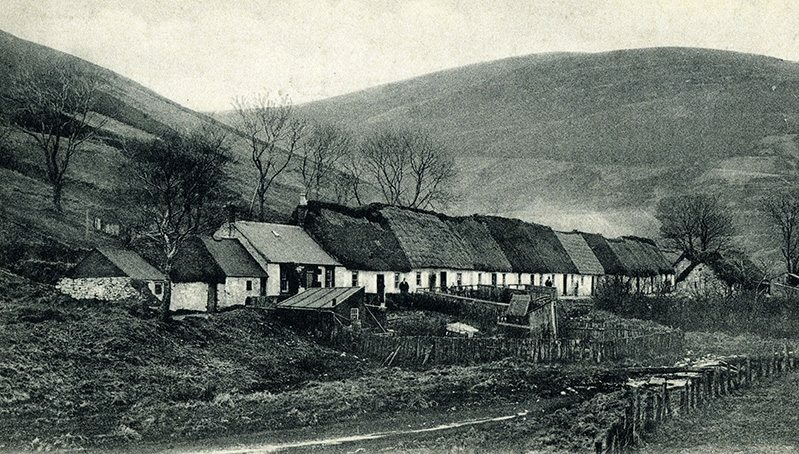 Scotland’s highest village… Meadowfoot cottages, Wanlockhead, in 1910. 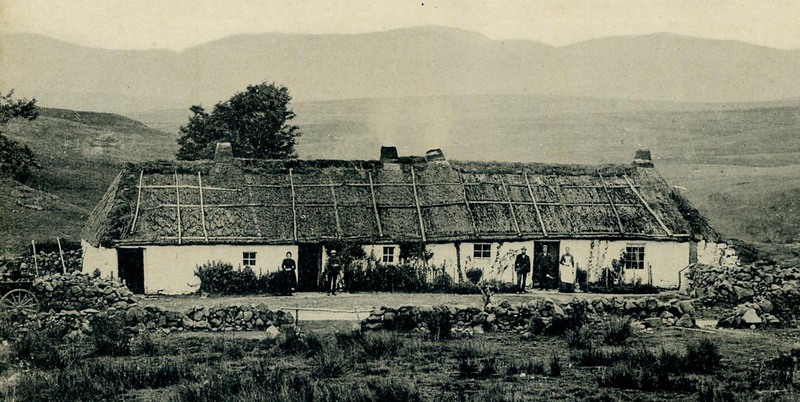 This Dumfriesshire mining village, shows a mixture of heather and straw thatching, all topped with turf. There is little outside fixing; which is surprising, in this high location. But no doubt the surrounding hills, provided some shelter. Roped Highland thatch in Wigtonshire… At Broadwall, near the exposed Mull of Galloway. 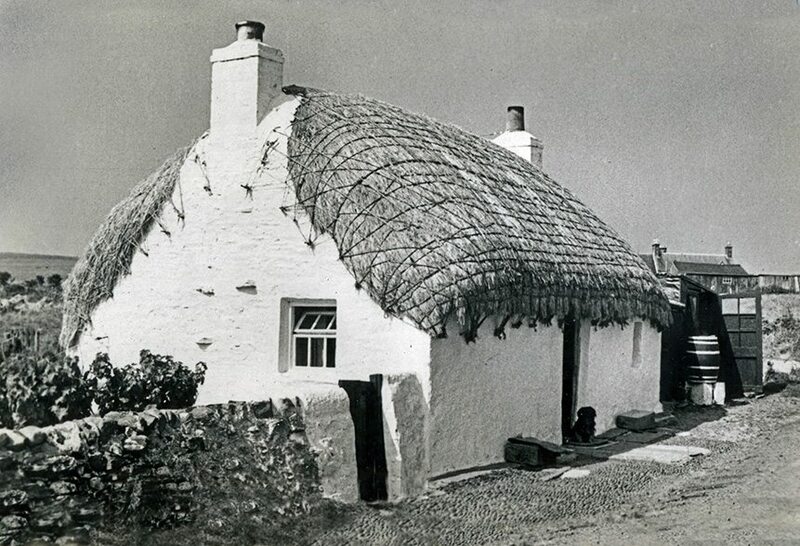 This 1950’s roof being similar to thatch further north, in the Hebrides and south, in the Isle of Man. The city of Glasgow, unlike many others, never seems to have banned thatch from covering it’s houses. Even after a couple of serious fires in the seventeenth century… It seems the main fire fighting was carried out by the use of leather buckets. After the fire of 1652, it was stated that the city’s buckets were either ‘’stoline away or brockine’.’ The City’s Grammer School was thatched in the 1570’s, when the authorities ordered it made ‘waterfast’…. So, forty eight shillings were paid for “twelve threif of quheit straye to theik” the school, and eight pounds ‘Scots’ were given to James Fleming for “mending” it…. 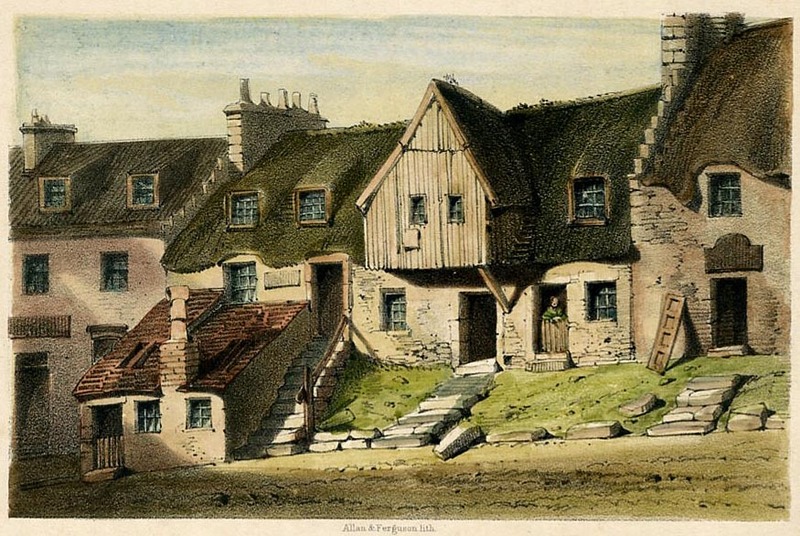 ‘A cottage in the High Street, Glasgow’…from a 1817 watercolour by Andrew Donaldson. The artist showing standard thatching with a turf ridge. 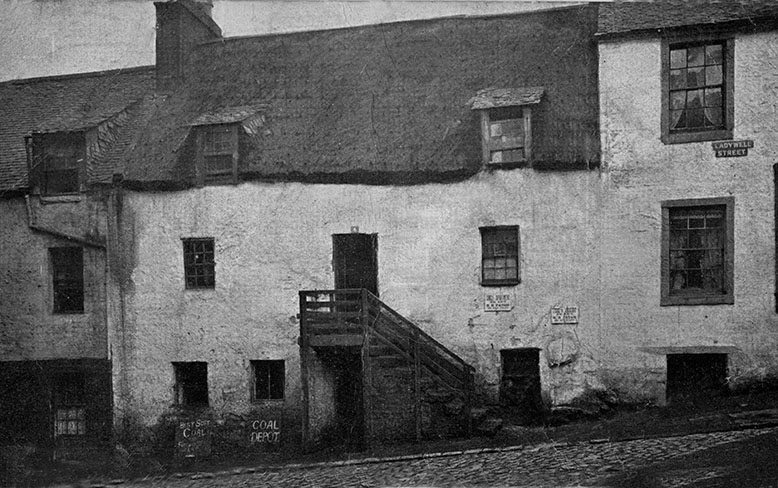 Glasgow Thatch… This image, from around 1860, is untitled, but is very likely some more city thatch.